The county garage operates 14 of these trucks which are versatile in their capability to handle snow and ice on the roads. They can carry approximately 10 tons of salt or cinders to spread for melting and grit and plow the road simultaneously. 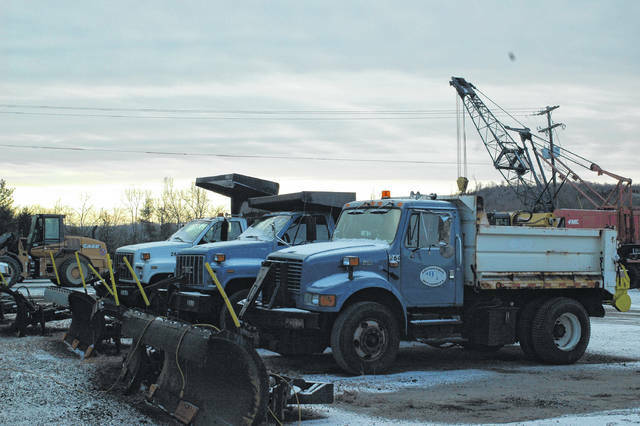 GALLIA COUNTY — On Wednesday, residents awoke to a dusting of snow on the ground, reminding everyone winter has indeed arrived. Gallia County Highway Superintendent Bill Swain has crews ready to handle the winter weather and keep roadways as safe as possible. The county trucks are prepared with salt and plows. The county garage is responsible for more than 450 miles of roadway in Gallia, which they divide into 14 routes that can be covered simultaneously. The county maintains 14 large single and tandem axle trucks the can carry about 10 tons of salt or cinder and have plow hookups. With 14 trucks, there are 14 drivers that all have individual routes they are responsible for when the weather hits and they are sent out, spreading out the plows and salt to cover the most area as quickly as possible. When cold weather snow hits, the superintendent considers several variables to appropriately respond. The timing is a major component. Swain explained that if the roadways are slick during the night, law enforcement on duty can make contact with him and garage staff are called out to begin clearing the roadways. Another is the kind of snow and weather that is occurring. If substantial rain turns into snow, preemptive salting serves no purpose as the rain washes away the salt before it can melt any snow. In that case, the county garage has to wait for the snow to be on the ground before they can begin treating with cinders and salt. Plowing is not always necessary either. Plowing roads without enough snow on them can run the risk of damaging the road surface. Plowing is almost always set up to treat with salt or cinders as well. “Its like anything else, they’re all different. The last few winters have been pretty light, I think we’re due to get a good one,” said Swain. Swain is planning for a colder, snowier year than there has been in recent years. “The odds are that we will be out a lot this year plowing and treating. We’re prepared for that, we have enough salt and cinders,” stated Swain. When cold weather does hit and the plow trucks are out treating and clearing roadways, Swain and Brett Boothe, Gallia County Engineer, both encourage motorists to give extra clearance to plow trucks and pay special attention to the winter weather advisories.